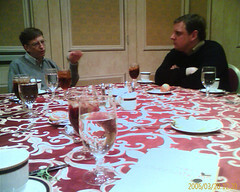 mike flew out for a microsoft event in las vegas last night as a journalist and because of the influence of techcrunch.com.nik just pointed out some photos on mikeâ€™s flickr account showing him @ lunch with bill gates. it didnâ€™t seem like a very big lunch, ie, it was pretty exclusive. i had lunch with mike yesterday, so Iâ€™m going to claim 1 degree of separation from the richest man in the world. as for mike, iâ€™ve got now idea how he pulled this off. iâ€™ll be sure to ask him about it when he gets back to the crunchhouse. This entry was posted in General, Personal by Geoff. Bookmark the permalink.